Knowing his strengths, crown club winner of the month David Anderson, tends to his customers every need while trusting his wife with the numbers. Together, it’s been a formula for success in Atlanta for the winning franchise owner. Anderson’s latest account is one of the city’s finest restaurants and is located in the heart of Midtown Atlanta. The restaurant is part of an international conglomerate called ONE Group, a global leader in the hospitality industry and the creator of the international restaurant brand STK. After signing the account, Anderson has added additional staff to his team. 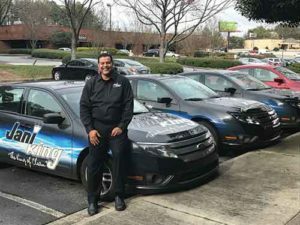 As the owner/operator of the franchise, he spends the majority of his time and energy focusing on providing customers with top notch cleaning and customer service.